Whether it is liquidation, administration or winding up petitions, insolvency can take many forms for businesses. As licensed insolvency practitioners we have helped over 1,000 business steer a route through their financial problems and are well placed to help you whatever your situation. Understanding what insolvency means for your business can be daunting and we appreciate that you will have a lot of questions and concerns. That is where our Frequently Asked Questions (FAQs) page can help. Click on the links below to find out more. Administration is a fast legal process that stops creditors taking legal action against a company or partnership in order to recover outstanding debts. Pre-Pack Administrations are a viable option where businesses with high value of goodwill can be rescued. Pre-Pack Administration can be quick to arrange and help to stop clients and customers leaving, making a change in ownership as smooth as a transition as possible. Bankruptcy occurs when a business or individual cannot repay the debts owed to creditors. You can make yourself or your business bankrupt or be forced into it by one of your creditors. 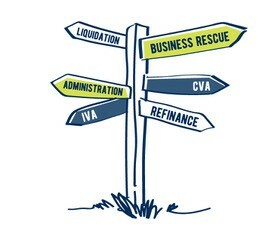 Insolvency occurs when a business does not have enough assets to cover its debts as they fall due. Failure to pay your debts can result in a business becoming insolvent. Liquidation is the legal process by which a business (limited company or partnership) is brought to an end. A company or partnership usually stops trading as soon as it enters into the liquidation process. Members Voluntary Liquidation (MVL) is a voluntary procedure where a company with net assets over £25,000 is put into liquidation. If the business is viable and still has a future then a Company Voluntary Arrangement or Individual Voluntary Arrangement can be considered as a way forward. This is often called a rescue. Wrongful or Fraudulent Trading occurs when the directors of a company traded a company after they knew that they could not avoid liquidation or take steps to reduce the loss to company's creditors.